Before 1984, when Inoue et al first described the clinical application of percutaneous mitral balloon valvuloplasty (PMBV),  surgical mitral commissurotomy was the preferred option for patients who had severe mitral stenosis (MS). Since its introduction, percutaneous mitral commissurotomy has demonstrated good immediate and midterm results [2, 3] and has replaced surgical mitral commissurotomy as the preferred treatment of rheumatic MS in appropriate candidates. The image below depicts mitral stenosis. 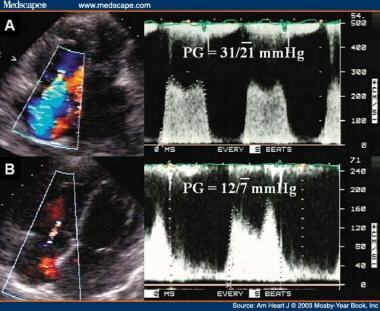 The images below depict simultaneous tracings of pulmonary capillary wedge pressure and left ventricular pressure in a patient with mitral stenosis before and after valvuloplasty. The human heart has 4 valves. The mitral valve connects the left atrium (LA) and the left ventricle (LV). The mitral valve opens during diastole to allow the blood flow from the LA to the LV. During ventricular systole, the mitral valve closes and prevents backflow to the LA. The normal function of the mitral valve depends on its 6 components, which are (1) the left atrial wall, (2) the annulus, (3) the leaflets, (4) the chordae tendineae, (5) the papillary muscles, and (6) the left ventricular wall. For more information about the relevant anatomy, see Mitral Valve Anatomy. Physical examination is an important initial step in assessing the pliability of the valve. Accentuation of the first heart sound (S1) occurs when the mitral valve leaflets are flexible. Marked calcification or thickening of the mitral valve leaflets reduces the amplitude of S1, probably because of diminished motion of the leaflets. In this system, points are given for leaflet mobility, valve thickening, subvalvular thickening, and valvular calcification. The final score is determined by adding the points for each of the components (maximum, 16 points). A score of 8 or lower is usually associated with excellent immediate and long-term results for PMBV, whereas scores higher than 8 are associated with less impressive results, including the risk of development of MR. 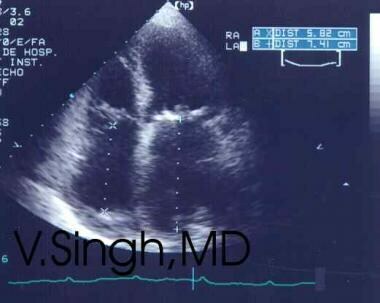 The image below depicts mitral stenosis as demonstrated with 2-dimensional (2D) echocardiography. Mitral stenosis as demonstrated with 2-dimensional (2D) echocardiography. The emphasis on direct examination of the commissures may allow treatment to be extended to some patients with unfavorable scores (eg, patients with severe leaflet calcification and decreased mobility without severe calcification of the commissures). Other patient subsets in whom results may not be accurately predicted by a simple score include elderly patients with nonrheumatic MS caused by annular calcification encroaching into the base of the mitral leaflet and patient with severe mitral inflow obstruction due to severe subvalvular fusion and little commissural fusion. Neither of these patient subsets should undergo PMBV. PMBV is now the procedure of choice for selected MS patients. Optimally, a team comprising an interventionalist and a cardiac imager collaborates during the preprocedural and periprocedural assessment. Targeted echocardiography not only is critical to the selection of candidates for PMBV but also can be of great value in guiding the procedure and assessing the results. Simultaneous echocardiography (transthoracic, transesophageal, or intracardiac echocardiography) directly illustrates the relation of the catheter to myocardial structures. In patients whose anatomy is distorted by an enlarged left atrium, echocardiography can be used to ensure that the catheter crosses the atrial septum at the level of the fossa ovalis. Catheter crossing elsewhere may give rise to complications, and a through the muscular portion of the septum may result in difficult manipulation of the balloon catheter. Echocardiography is useful for directing the catheter across the mitral valve; the balloon initially tends to position itself towards the lateral annulus in the left atrium. The equipment required depends on the specific approach to the procedure (see Technique). 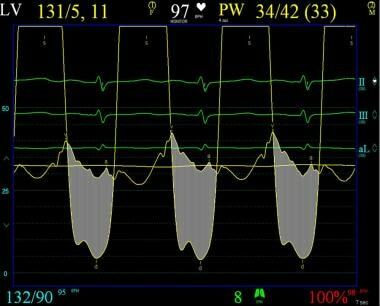 Usually, PMBV is done with the patient under moderate sedation. The patient remains in the supine position during the procedure. The Inoue balloon technique, first described in 1984,  is the one most commonly employed today (and the one used by the authors). Alternatives exist (see below) but are not as popular. The double-balloon technique is one of the 2 main techniques that are currently used. In this approach, after transseptal catheterization, a balloon-tipped catheter is advanced into the left ventricle. One or two exchange guide wires are advanced through the lumen of the balloon-tipped catheter and positioned in the apex of the left ventricle or, less frequently, in the ascending aorta. Bonhoeffer et al have described the use of the multitrack system, which is a refinement of the double-balloon technique that employs a monorail system requiring only 1 guide wire. This technique allows easier dilation than the standard technique; however, clinical experience with the multitrack system is still limited. Cribier et al introduced the metallic commissurotomy during the 1990s. This procedure is as efficacious as balloon commissurotomy, but it is more demanding on the operator than the Inoue technique and appears to carry a higher risk of hemopericardium as a consequence of the presence of a stiff guide wire in the left ventricle. The dilator is reusable, and the potential advantage of the procedure is its cost-effectiveness. The main steps of the Inoue approach to PMBV, as performed by the authors, are as follows. A 7-French sheath is inserted in the right femoral vein for transseptal access; another is inserted in the left femoral vein (or a second venous sheath in the right femoral vein, depending on physician preference) for a pulmonary artery catheter. A 5-French sheath is placed in the left femoral artery for left-heart catheterization. Three pressure transducers are required for simultaneous left atrial, left ventricular, and right-side pressures. A pigtail (or multipurpose) catheter is advanced to the aortic valve, and aortic pressures are obtained. Note that because a time delay is associated with transmission of the left atrial pressure through the pulmonary vasculature to the pulmonary capillary wedge position, using the pulmonary capillary wedge pressure instead of the left atrial pressure tends to result in overestimation of the gradient across the mitral valve. The goal of transseptal catheterization is to cross from the right atrium to the left atrium through the fossa ovalis. Puncture of the fossa ovalis itself is safe; the danger of the transseptal approach lies in the possibility that the needle and catheter will puncture an adjacent structure (eg, the coronary sinus, the posterior wall of the right atrium, or the aortic root). To minimize the risk of complications, the operator must have a detailed knowledge of the regional anatomy of the atrial septum. As viewed from the feet with the patient lying supine, the plane of the atrial septum runs from 1 o’clock to 7 o’clock. The fossa ovalis is posterior and caudal to the aortic root, anterior to the free wall of the right atrium, superior and posteriorly to the ostium of the coronary sinus, and well posterior of the tricuspid annulus and the right atrial appendage. It is approximately 2 cm in diameter and is bounded superiorly by the limbus. In the presence of aortic or mitral valve pathology, the atrial septal anatomy can be distorted. In mitral stenosis (MS), the intra-atrial septum becomes flatter with a more horizontal orientation, and the fossa tends to lie lower. The hub of the Mullins introducer to the Mullins sheath is locked. The sheath is inserted over a flexible 0.032- or 0.035-in. 145-cm J-tip guide wire, then advanced to the low superior vena cava (SVC). Once the wire has been removed, the catheter is flushed. The Brockenbrough needle is then advanced through the Mullins sheath and dilator until its tip is near, but not at, the distal aspect of the sheath. During this process, the needle and its direction indicator should be allowed to rotate freely so that the needle may follow the curves of the catheter and venous structures: the hub of the needle should never be grasped and rotated at this point. The progress of the needle tip should be monitored fluoroscopically to look for any sign of perforation of the catheter by the needle. The stylet is removed at the diaphragm, and the needle hub is connected to a pressure manifold via a stopcock with a short length of tubing and carefully flushed. The SVC pressure is then recorded through the needle, with the needle rotated so that the direction indicator points anteriorly. Under the guidance of continuous biplane fluoroscopy with straight posteroanterior and lateral views and with a pigtail catheter in the ascending aorta for pressure monitoring and spatial orientation of the aorta, the Brockenbrough needle and catheter are held in a constant relation as they are withdrawn slowly with both hands. The direction indicator is firmly controlled with the right hand and used to rotate the needle clockwise during withdrawal from the SVC until the arrow is oriented posteromedially (4 o’clock position as seen from below). As the tip of the catheter enters the right atrium, it moves slightly rightward (to the patient’s left). With slow withdrawal of the needle and catheter in the 4 o’clock orientation, a second rightward movement is felt as the catheter tip slips over the bulge of the ascending aorta. With further slow withdrawal, a third rightward movement is felt as the catheter tip snaps into the fossa ovalis. 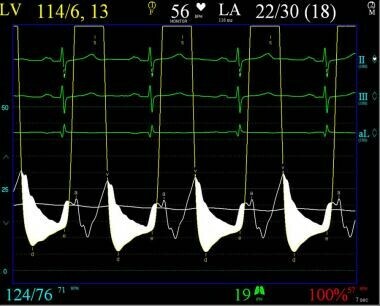 If the foramen is patent, the catheter may cross into the left atrium spontaneously at this point, as indicated by a change in atrial pressure waveform and the ability to withdraw oxygenated blood from the needle. Otherwise, the needle is advanced to the tip of the catheter, and the whole system is then advanced. The first “pop” is due to advancing the needle and dilator; once this occurs, the system is fixed in position and advanced until a second “pop” is felt. The sheath is slightly advanced, and the needle and dilator are removed. Successful entry into the left atrium should be confirmed both by recording a left atrial pressure waveform and by withdrawing oxygenated blood or demonstrating the typical fluoroscopic appearance of the left atrium during a small contrast injection through the needle. Once the catheter is safely in the left atrium, heparin (usually 5000 U) is administered for anticoagulation. Although echocardiography is not required during transseptal catheterization, this imaging modality could potentially improve the safety and precision of the procedure, especially in the early phase of the operator's experience. [14, 15, 16] These becomes particularly important in patients with previous septal surgeries or punctures, an excessively mobile septum, or with very large atria or distorted anatomy, as can be seen in patients with significant scoliosis or a history of pneumonectomy. Both transesophageal (TEE) and intracardiac echocardiographic (ICE) approaches have been used [14, 15, 16] ; however, using the TEE approach is not always easy in the cardiac catheterization laboratory (it requires extra physician support and, often, general anesthesia), and it is best used in selected cases with severe anatomic distortions or other technical challenges. More recently, a real-time three-dimensional (3-D) TEE technique has been used to enhance the visualization of the interatrial septum and the assessment of optimal location for transpetal puncture. Currently, ICE has become the imaging modality of choice for many operators to identify the fossa ovalis and to guide placement of transseptal puncture at the limbus. [14, 15, 16] Tenting of the septum by the transseptal needle can be visualized by echocardiography, and the exact position of the septal puncture can be chosen. Crossing at the level of the fossa ovalis in the posterior inferior part is best for most PMBVs. Additionally, a full survey by ICE prior to performing PMBV to assess the left atrial appendage and the mitral valve can be done. The pulmonary artery catheter is then advanced through the left femoral venous sheath (or second right femoral sheath), and thermodilution cardiac output is measured. The pigtail catheter is advanced to the left ventricle to measure ventricular pressure. The gradient across the mitral valve is measured, and the valve area evaluated. Echocardiography can also be used to measure the gradient across the mitral valve, and parasternal short-axis views are used to look at mitral valve commissures. The silver metal hub is advanced to the gold metal hub (the gold hub should not be advanced to the plastic hub without a balloon over the Inoue wire, because the gold metal elongator will perforate the balloon). The vent port is opened and flushed with saline through the balloon port; this should be done slowly so as not to inflate the balloon. Once the vent port is properly flushed, it is closed. This process ensures that the balloon will be completely free of air should it rupture. The balloon is then inflated to the desired size, with every 1 mL in the syringe equaling a 1-mm increase in the diameter of the balloon (the balloon size is measured at the waist). The balloon diameter is measured outside the patient’s body with the ruler included in the kit. Inoue wire is advanced to the left atrium, making loops in the atrium, and the Mullins sheath is removed. The interatrial septum is dilated with a 14-French dilator. The Inoue balloon is loaded on the wire (this part of the procedure is sheathless), and the balloon is elongated outside the body by advancing the gold hub (with the silver hub attached) to the plastic hub and securing it (if this step is not done over a wire, the gold metal elongator will perforate the balloon). The Inoue balloon is then advanced to the left atrium, and the guide wire and inner metal elongator are removed. The silver and gold elongators are pulled back in a single motion to the point where the gold elongator stops (approximately 3 cm), and the silver hub and the Inoue wire are pulled back and all the way out. The stylet is then inserted; this creates a more receptive balloon for tuning. The left ventricular catheter is pulled out of the ventricle to the ascending aorta. The distal portion of the Inoue balloon is inflated, and the balloon is pulled back to ensure stabilization beneath the mitral valve annulus. Inflation occurs next at the level of the proximal part of the balloon and finally in the central portion, with the disappearance of the central waist at full inflation. The video below depicts this technique as performed by authors at a different institution. The balloon is then deflated and withdrawn into the left atrium. Depending on the Abascal score and the presence or absence of commissural calcification, the first inflation may be stopped short of the maximal balloon size, then increased in 1-mm steps, depending on results. Echocardiographic measurements are repeated. At this point, the pulmonary arterial pressure should be monitored closely because a jump in this pressure suggests the development of acute mitral regurgitation (MR). If, on color Doppler echocardiography, MR has not increased by more than 1 grade and the mitral valve area is less than 1 cm2/m2 of body surface area, the balloon is advanced across the valve, and mitral valvuloplasty is repeated with a balloon diameter increased by 1 mm. While the balloon is withdrawn into the left atrium, the stylet is removed and the catheter is connected to pressure monitoring. This should be done through the middle port, the one that the Inoue wire goes through. At this point, the pigtail (or multipurpose) catheter is readvanced into the left ventricle, and hemodynamic measurements (including cardiac output) are repeated. The Inoue balloon is then reelongated in the left atrium by inserting the Inoue wire telescoped through the silver metal elongator to the gold hub. The operator should make sure all of the loops are in the left atrium before reattaching the gold hub to the plastic hub. Before pulling out the pulmonary artery catheter out, the operator should check oxygen saturations in the pulmonary artery, the inferior vena cava (IVC), and the SVC to check for any new left-to-right shunts. The procedure may be ended when there is an adequate increase in valve area, decrease in the mitral valve gradient, or increase in the degree of MR. 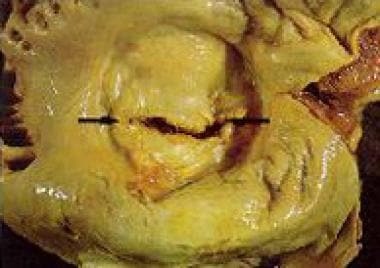 The image below depicts tricuspid regurgitation after percutaneous mitral valvuloplasty. Tricuspid regurgitation after percutaneous mitral valvuloplasty. Procedural mortality ranges from 0-3% in most series. The main causes of mortality include left ventricular perforation and the patient’s poor general condition. The frequency of severe MR ranges from 2% to 19% in different series. [17, 19, 20] Surgical findings  suggest that this complication is related to noncommissural tearing of the posterior or anterior leaflet. Additionally, with significant asymmetric commissural calcification, the noncalcified commissure can tear, causing severe MR. The frequency of atrial septal defects after mitral valvuloplasty ranges from 10% to 90% in different series. These are typically small and restrictive shunts. Significant right-to-left shunts occur on rare occasions in patients who had pulmonary hypertension and elevated right heart pressures. The reported incidence of hemopericardium ranges from 0.5% to 12.0%. This complication may be due to transseptal catheterization or to apex perforation by the guide wires or the balloon. In case of pericardial hemorrhage, emergency pericardiocentesis should be performed in the catheterization laboratory to stabilize the patient’s condition and allow transfer for cardiac surgery. The frequency of embolic events related to mitral valvuloplasty ranges from 0.5% to 5.0%. On rare occasions, such events can cause of permanent severe disability and even death. In view of the severe potential consequences of this complication, it is critical for the operators to take all possible precautions to prevent it. The incidence of complete heart block is 1.5%. This is mostly transient; rarely, patients may require a permanent pacemaker. The failure rate ranges from 1% to 17%. Failures can result from unfavorable anatomy (eg, severe atrial enlargement or predominant subvalvular stenosis or heavy calcification), but most failures occur during the initial portion of the operator's learning curve, often as a consequence of an unsuccessful transseptal puncture or inability to position the balloon across the mitral valve correctly. Inoue K, Owaki T, Nakamura T, Kitamura F, Miyamoto N. Clinical application of transvenous mitral commissurotomy by a new balloon catheter. J Thorac Cardiovasc Surg. Mar/1984. 87(3):394-402. [Medline]. Rahman F, Akhter N, Anam K, Rashid MA, Uddin MJ, Ahmed CM, et al. Balloon mitral valvuloplasty: immediate and short term haemodynamic and clinical outcome. Mymensingh Med J. 2010 Apr. 19(2):199-207. [Medline]. Zhao Q, Hu X. Systematic comparison of the effectiveness of percutaneous mitral balloon valvotomy with surgical mitral commissurotomy. Swiss Med Wkly. 2011 Apr 14. 141:w13180. [Medline]. Bonow RO, Carabello BA, Chatterjee K, de Leon AC Jr, Faxon DP, Freed MD, et al. 2008 focused update incorporated into the ACC/AHA 2006 guidelines for the management of patients with valvular heart disease: a report of the American College of Cardiology/American Heart Association Task Force on Practice Guidelines (Writing Committee to revise the 1998 guidelines for the management of patients with valvular heart disease). Endorsed by the Society of Cardiovascular Anesthesiologists, Society for Cardiovascular Angiography and Interventions, and Society of Thoracic Surgeons. J Am Coll Cardiol. 2008 Sep 23. 52(13):e1-142. [Medline]. Libby P., Bonow RO., Mann DL., Zipes DP. Valvular Heart Disease. Braunwald's Heart Disease A Textbook Of Cardiovascular Medicine. 8th. Saunders Elsevier; 2008. 2: 62. Wilkins GT, Weyman AE, Abascal VM, et al. Percutaneous balloon dilatation of the mitral valve: an analysis of echocardiographic variables related to outcome and the mechanism of dilatation. Br Heart J. 1988. 60:299-308. [Medline]. Cannan CR, Nishimura RA, Reeder GS, Ilstrup DR, Larson DR, Holmes DR, et al. Echocardiographic assessment of commissural calcium: a simple predictor of outcome after percutaneous mitral balloon valvotomy. J Am Coll Cardiol. Jan 1997. 29(1):175-80. [Medline]. Hilliard AA, Nishimura RA. The interventional cardiologist and structural heart disease: the need for a team approach. JACC Cardiovasc Imaging. Jan 2009. 2(1):1-7. [Medline]. Topol EJ. Mitral valvuloplasty. Textbook of Interventional Cardiology. 5th. Saunders Elsevier; 2008. 50. Joseph G, Chandy S, George P, George O, John B, Pati P, et al. Evaluation of a simplified transseptal mitral valvuloplasty technique using over-the-wire single balloons and complementary femoral and jugular venous approaches in 1,407 consecutive patients. J Invasive Cardiol. Mar 2005. 17(3):132-8. [Medline]. Bonhoeffer P, Esteves C, Casal U, et al. Percutaneous mitral valve dilatation with the Multi-Track System. Catheter Cardiovasc Interv. Oct 1999. 48(2):178-83. [Medline]. Cribier A, Eltchaninoff H, Koning R, Rath PC, Arora R, Imam A, et al. Percutaneous mechanical mitral commissurotomy with a newly designed metallic valvulotome: immediate results of the initial experience in 153 patients. Circulation. Feb 1999. 99(6):793-9. [Medline]. Baim DS. Percutaneous Therapies for Valvular Heart Disease. Grossman's Cardiac Catheterization, Angiography, and Intervention. 7th. Lippincott Williams & Wilkins; 2006. 25. Mitchel JF1, Gillam LD, Sanzobrino BW, Hirst JA, McKay RG. Intracardiac ultrasound imaging during transseptal catheterization. Chest. Jul 1995. 108(1):104-8. [Medline]. [Full Text]. Green NE, Hansgen AR, Carroll JD. Initial clinical experience with intracardiac echocardiography in guiding balloon mitral valvuloplasty: technique, safety, utility, and limitations. Catheter Cardiovasc Interv. Nov 2004. 63 (3):385-94. [Medline]. [Full Text]. Cavalcante JL, Rodriguez LL, Kapadia S, Tuzcu EM, Stewart WJ. Role of echocardiography in percutaneous mitral valve interventions. JACC Cardiovasc Imaging. Jul 2012. 5(7):733-46. [Medline]. [Full Text]. Iung B, Cormier B, Ducimetière P, Porte JM, Nallet O, Michel PL, et al. Immediate results of percutaneous mitral commissurotomy. A predictive model on a series of 1514 patients. Circulation. Nov 1996. 94(9):2124-30. [Medline]. Palacios IF, Sanchez PL, Harrell LC, Weyman AE, Block PC. Which patients benefit from percutaneous mitral balloon valvuloplasty? Prevalvuloplasty and postvalvuloplasty variables that predict long-term outcome. Circulation. Mar 2002. 105(12):1465-71. [Medline]. Iung B, Nicoud-Houel A, Fondard O, Hafid Akoudad, Haghighat T, Brochet E, et al. Temporal trends in percutaneous mitral commissurotomy over a 15-year period. Eur Heart J. Apr 2004. 25(8):701-7. [Medline]. Varma PK, Theodore S, Neema PK, Ramachandran P, Sivadasanpillai H, Nair KK, et al. Emergency surgery after percutaneous transmitral commissurotomy: operative versus echocardiographic findings, mechanisms of complications, and outcomes. J Thorac Cardiovasc Surg. Sep 2005. 130(3):772-6. [Medline]. Choudhary SK, Talwar S, Venugopal P. Severe mitral regurgitation after percutaneous transmitral commissurotomy: underestimated subvalvular disease. J Thorac Cardiovasc Surg. 131(4). Apr 2006:927. [Medline]. Ben-Farhat M, Betbout F, Gamra H, Maatouk F, Ben-Hamda K, Abdellaoui M, et al. Predictors of long-term event-free survival and of freedom from restenosis after percutaneous balloon mitral commissurotomy. Am Heart J. Dec 2001. 142(6):1072-9. [Medline]. Wang A, Krasuski RA, Warner JJ, Pieper K, Kisslo KB, Bashore TM, et al. Serial echocardiographic evaluation of restenosis after successful percutaneous mitral commissurotomy. J Am Coll Cardiol. Jan 2002. 39(2):328-34. [Medline]. Fawzy ME, Shoukri M, Al Buraiki J, Hassan W, El Widaal H, Kharabsheh S, et al. Seventeen years' clinical and echocardiographic follow up of mitral balloon valvuloplasty in 520 patients, and predictors of long-term outcome. J Heart Valve Dis. Sep 2007. 16(5):454-60. [Medline]. Hildick-Smith DJ, Taylor GJ, Shapiro LM. Inoue balloon mitral valvuloplasty: long-term clinical and echocardiographic follow-up of a predominantly unfavourable population. Eur Heart J. Oct 2000. 21(20):1690-7. [Medline]. Dr. Hilliard would like to thank his mentors at the Mayo Clinic, Drs. Rick Nishimura and Charanjit Rihal, for their dedication to fellow education.